Darren Dreger of TSN tweeted earlier today that the fifth goal in last night's Canucks - Blackhawks game should not have counted. The NHL's supervisor of officials, Terry Gregson, conferred with the referees and in hind sight acknowledged that the goal should have been disallowed. The reason for the 'missed call' is unknown, but Dreger and TSN speculate that the referees were distracted by looking for the puck at the goal line rather than the players and their positioning. While the referees may have missed it, it's hard to comprehend for Canucks fans who all saw it clear as day as it happened. In a series full of twists and turns and endless changes in momentum, it really was salt in the wounds of the Dustin Byfuglien and goaltender interference storyline. 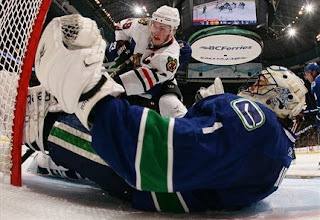 The series last year between these two teams ignited much debate, especially in Vancouver, about goaltender interference and questions about why Blackhawk forwards were allowed to bombard the Vancouver net with bodies and sticks with no restitution to the Canucks by the referees. That makes last night's call even tougher to swallow for Canucks fans who heard NHL officials vow to crack down on such actions before the playoffs began. Sure, the fifth goal of the evening gave the Blackhawks a three goal lead in the third period and could have been inconsequential. However, the Canucks are the best team in the NHL at coming back in the third period, were generating momentum and are the highest scoring team in the third period in the NHL, and the highest scoring team remaining in the NHL Playoffs. Regardless of the call last night, the series is 2-1 Blackhawks and the Canucks simply must apply themselves better in Game 4 on Friday. They will have to play tougher in front of their own net, tougher in front of the Chicago net, and really appear to want the game more. Of course, now that the NHL has admitted they blew the call on the fifth goal (and hey, admitting you have a problem is the first step to recovery), and now that the Canucks have vowed to give Antti Niemi and the Blackhawks a taste of their own medicine, is it obvious to anyone else that the Canucks will likely receive goaltender interference penalties or a crucial disallowed goal on Friday? Bounces have gone both ways throughout this series and bad calls have also gone both ways. The one constant throughout this series is the team that has appeared to want it more has won every game of this series. On the positive side for Vancouver, without the Sedins and Ryan Kesler and Mikael Samuelsson having done much offensively, and without Roberto Luongo having played his best and frustrating the Blackhawks offense, it's pretty obvious that the Canucks have much room for improvement. The only question is, will they find their game in time?